An emotionally riveting drug-addiction drama cements Timothée Chalamet as the real deal. "Timothée Chalamet, all of 22 years old and indelible as two radically different kind of boyfriends in last year’s Call Me by Your Name and Lady Bird, is doing major things in his new movie, Beautiful Boy—things that no other actor of his generation is attempting. You have to go back to Marlon Brando to see these kind of heartbreaking frowns, the angelic face turned upward, wrestling with frustration. 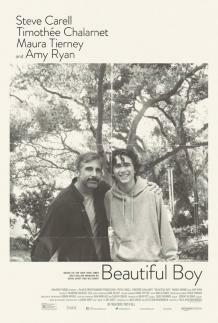 Chalamet is playing a college-bound kid derailed by drugs: meth, pills, everything. What he’s pulling off in a diner with Steve Carell (as the panicky out-of-his-depths dad)—a combination of cajoling, breaking down, acting fake-tough—is incredibly tricky. Even subtler are Chalamet’s wordless moments.